Below I outline some fun school holiday activities in Melbourne for the upcoming April school holidays. If you are after tips on making the most of the school holidays and actually enjoying them with the kids, you might like to check out my School Holiday Tips post. You can scroll through the school holiday activities or click on the activity of interest from the list below to jump directly to that item. I am yet to do this with the kids, but found out about this one from some lovely mums at the kid’s primary school who highly recommended them. Description: There are a number of different walks you can choose from in the Melbourne CBD area. There is a booklet for each walk that you pay for. Each booklet has a map and directions to follow to take you on an interesting walk. After payment you download the booklet and print it off yourself. The walks are like a treasure or scavenger hunt as you need to hunt around the sights to find the answers to clues that will allow you to solve a final puzzle. The walks are specially designed to lead you to some of Melbourne’s most treasured sights. When you have solved the final puzzle you will be able to enter the competition to win an Amazon or Cole/Myer voucher. We have been to the National Sports Museum a number of times and had a fantastic time. It is an attraction that blends passive activities looking at the memorabilia and watching the holograms with full on physical activity in the Game On area. For more tips on getting the best out of your visit to the NSM, please see my post Review: National Sports Museum. Face painting, Tuesday April 8, Tuesday April 15, Wednesday April 16 and Thursday April 17, midday to 2.00pm. Date and Time: Saturday April 5 – Monday April 21, 2014 (except Good Friday). From 10.00am-5.00pm on all days. Cost: Adults $20, Children (5 – 15) $10, Children under 5 free. Family (2 adults and 4 children) $50. These are for admission only. If you wish do the tour, there is an additional cost. Ages: While the preschooler did enjoy looking around, his participation was limited in the Game On area. I would recommend it for school age children. Bean Bag cinema is a revolutionary experience – it’s the new Hoyts chill out zone and the only cinema where you can enjoy the latest quality blockbusters from the comfort of your very own deluxe beanbag. A world-first in cinema design, this is entertainment at its coolest! Bean Bag cinema is about comfort, fun and kicking back in your own individual style. Distinctly unique, with a fresh and funky vibe, Bean Bag cinema is the the perfect function alternative for those after something a little bit different! Ages: Doesn’t state any age restrictions, but I think this would be best for upper primary and secondary kids. Location: Only one in Melbourne to date, which is at Hoyts Melbourne Central. There are other locations around the country. Bookings: Required. Booking can be made online. LEGO Educational Centre (Moore Educational) is running a LEGO school holiday program. The details of which you can see above. You can check out their website for further information on exactly what each session entails. The sessions are 45 minutes and book your child for a full morning or afternoon session (3 workshops) and your child receives a LEGO Brick Name Badge. Box Hill Community Arts Centre has a comprehensive school holiday program. You can see the full details here and I have included some highlights below. These sessions always book out so get in asap! In this afternoon session, family members all work together to make a beautiful clay cake stand with mini cupcakes. Book early – places fill fast. Suitable for families with children 6 years and over. Firing and Glazing included in price. More information and bookings click here. Sci Kids -Optical Illusions – Now you see it, Now you don’t! Kids will learn basic ideas about physics and biology through creating art projects with a science theme. Make a spinning bird, adapted dragon and moving slider cards, these optical illusions will be great to take home and trick and test your family. This workshop is run by Sci Kids. More information and bookings click here. Make your very own scarecrow with Little Veggie Patch Co! In these half hour, hands on workshops kids will make their own scarecrows, learning how to stuff and decorate them. The scarecrows are approximately one meter tall, so easy to bring home and scare those crows away! Bring your old kids clothes along, or for an extra $5 they will provide clothes. The School runs creative classes for adults and kids. Established by one of Australia’s leading stylists, Megan Morton it is running sessions in Melbourne (and Sydney) these school holidays. 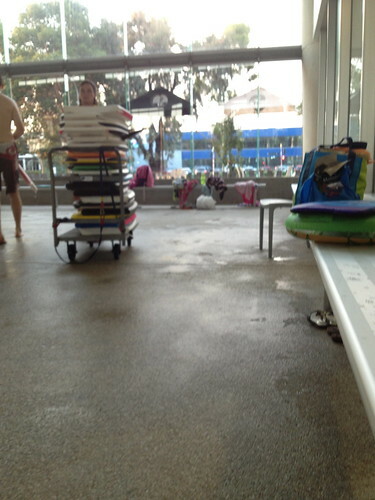 You can see my full review of The Monash Aquatic & Recreation Centre here. Adequate supervision requires the parent/guardian to accompany the child in the water & remain within arm’s reach of the child at all times. If parent is unable to supervise the under 5 year old in the water the under 5 year old is restricted to the toddlers pool area only. The parent / guardian must supervise the under 5 from side of the toddler pool.